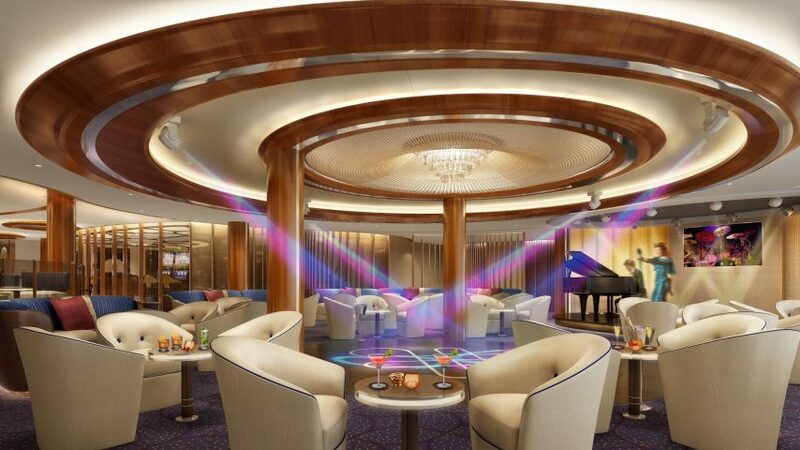 Luxury line Seabourn has revealed the new look for The Club, the lounge for the upcoming Seabourn Encore, as designed by hospitality icon Adam D. Tihany. The Club will feature live music; cocktails, wines, and canapés; an intimate casino; and access to The Club Terrace, a lounge area with two whirlpool spas and a plunge pool. Ovation of the Seas will strut her stuff for British cruise fans before heading to China, with two return trips from Southampton next April. Booking has opened for a 5-night cruise to France and Belgium embarking April 17 and a 7-night cruise to Spain and Gibraltar on April 22. Then, the new ship departs May 3 for Barcelona – the first leg of a 56-night repositioning cruise (booked in five sections) to her new homeport in Tianjin. Regent Seven Seas Cruises has unveiled a third new specialty restaurant for the ultra-luxurious Seven Seas Explorer, an elegant pan-Asian venue called Pacific Rim. The lobby features a Tibetan prayer wheel, and the ocean-view windows are shaped like lotus flowers; the menu has treats like cassia-braised pork belly topped with grilled diver scallops, tempura-battered Canadian lobster with shiso leaf and orange ponzu sauce, and miso-spiced black cod wrapped in hoba leaf accompanied by pickled daikon and spicy den miso. Pandaw River Expeditions is allowing Asia fans a first, sending their newest ship, Laos Pandaw, on the first cruises ever to sail the Upper Mekong River. The 14-day itinerary sails through the Golden Triangle from Vientane, Laos, to China’s Yunnan province and back, with overnights in Luang Prabang, Laos; Chiang Saen, Thailand; and Jinghong, China. “There is much to explore in this undiscovered region,” says line founder Paul Strachan. Steve Earle, Lucinda Williams, Black Oak Arkansas, The Mavericks, Blackberry Smoke, and Mojo Nixon are among the acts set to perform on the inaugural Outlaw Country Cruise. The 4-day sailing from Miami to Grand Cayman embarks February 7, 2016, on Norwegian Pearl. Guests will have access to meet-and-greets with performers as well as chances to participate in live recordings for SiriusXM.